The filter element is placed in a container with contaminated water, situated about 70 cm above the clean water container. The siphon is started by squeezing the rubber bulb. The siphon pressure forces the water through the filter element, ensuring a high flow of filtered water. 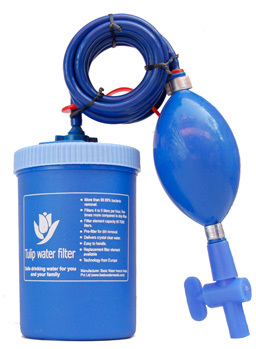 Households: The Siphon water filter is ideal for use within households. The filter is easy to use and affordable for most households. The filter can clean up to 5 liters an hour, providing enough safe drinking water for an (extended) family. Emergency situations: The Siphon filter is light, small, affordable, simple to use and transport, making it an appropriate solution to provide safe drinking water in post-disaster situations. To protect the filter element against premature clogging when using dirty water, the filter element is covered by a washable pre-filter. After some time, the flow rate will reduce because of clogging of the filter element. In this case, the filter can be cleaned by backwashing. This is done by closing the tap and squeezing the rubber bulb, which forces the water back through the filter element, pushing dirt particles out and unclogging the filter. When additional backwashing does not result in a sufficient flow, a small layer of the ceramic material of the filter element has to be removed by scrubbing the filter with a scrub pad which is included. One of the core values of BWN is ‘affordable’. Therefore we will always strive to work in the most cost-effective way. Considering one filter can clean up to 7,000 liters, the price per liter is between $ 0.002 and $ 0.005, depending on the distribution situation. For more information on our local agents, our products, or a personal quotation, please contact us.